Activation Multi-Box LITE: HENRICH it's addiotnal activation for Multi-Box LITE for support Alcatel and LG phones. In this module you will find support for Alcatel ExxxAlcatel OT320, Alcatel OLD, LG 2G, LG 3G. FOr activation SN of Box are required. 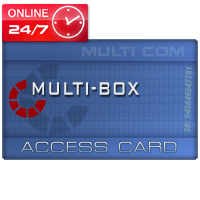 Activation Multi-Box LITE: KARWOS it's addiotnal activation for Multi-Box LITE for KARWOS pack software. In this module you will find support for Nokia: DCT4, WD2, BB5 + FIA Tool, SonyEricsson: Broadcomm Tool (J210,J220,J230,Z300), Samsung: Quallcomm Tool (Z100, Z105, Z105u, Z105v, Z107, Z107u, Z107v, Z110, Z130, Z140, Z300, Z500, Z510, Z700), TDi. FOr activation SN of Box are required.